My husband has always given me flowers for Valentine’s Day, and I love it. I am, admittedly a flowers kind of girl, so it works for me, and is an easy win for him! He, however, is considerably more difficult to buy for. He’s not a big gifts guy, so he doesn’t get too excited over wrapping paper, bags and boxes. But he’ll gladly celebrate the holiday, and can muster up some enthusiasm for gifts, especially if a little creative thought has been paid. Flowers die, and chocolates get consumed. Cards get filed in a night stand drawer, and heart-shaped anything goes out of style on February 15th. But with a little creative forethought, a Valentine’s Day gift can add a little spice and romance not just to February 14th, but the other 364 days as well. Here are four gift ideas to take you out of the flowers and chocolate box and make an impression this Valentine’s Day. If you’ve ever searched for or purchased anything related to a significant date in your life, your personalized ads on social media have likely brought up a star map service. That’s where I first learned about this unique form of customizable artwork that creates a print of the night sky over a certain location on a certain date. Many services like the sample above from ‘The Night Sky’ allow you to customize a message, as well as specify the date and location of the image. Personally, we have a print of the night sky from over our reception venue from our wedding day. It’s an interesting conversation piece for visitors who have never seen one before, and obviously holds quite a bit of sentimental value for Josh and I. It was an unexpected gift that’s become a staple of our living room decor, and has a shelf life long past Valentine’s Day. Let’s assume that not every gift you give has to be a romantic signature piece that lasts in your life and home forever. Maybe you feel a little irreverent towards Valentine’s Day in general. Maybe you and your significant other aren’t really the sentimental type. Maybe you wouldn’t normally exchange gifts. Whatever the case, if you’re looking for a light-hearted, funny, and yet still romance themed gift, this notepad from “Knock Knock” is worth a look and a laugh. Just specify when you want it, why you want it, and sign and date. It’s up to you how you deliver the request, but rest assured that the message will be received loud and clear. Pro tip! Make sure you dispose of your fulfilled notes as they can be an awkward find for people around the house. Chocolate covered strawberries may feel a bit traditional for an out of the box Valentine’s Day list, which is why these berries come with a tipsy twist. 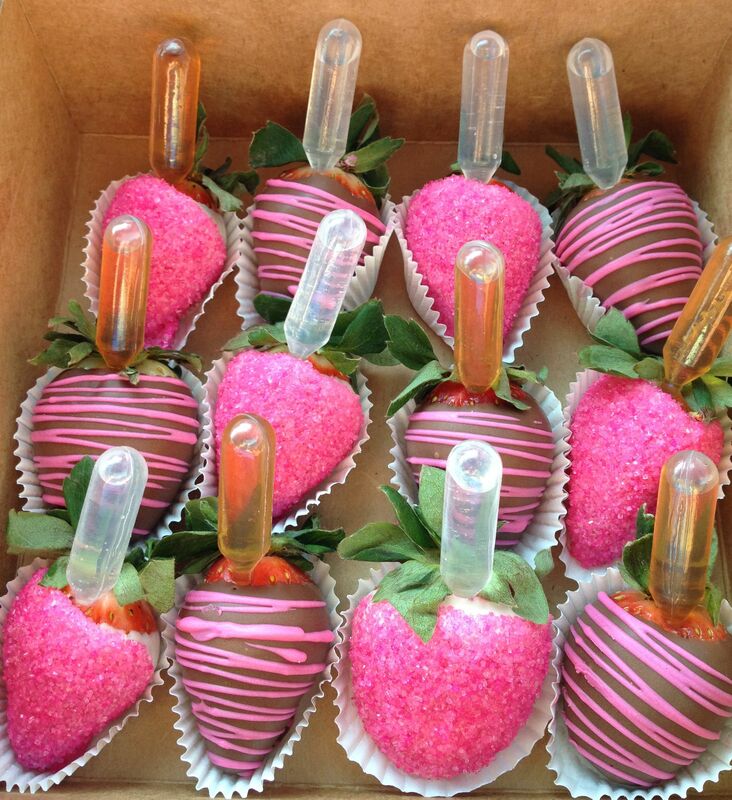 Tipsy berries are chocolate covered strawberries with a small, rubber pipette inserted into them. The pipette holds a small amount of liquor or wine that, when squeezed, infuses the liquid into the berry. It’s unlikely that you’ll find them at a standard grocery store, but check your area bakeries and floral/gift shoppes as to whether they’re a special holiday order item. It was actually our local Mexican restaurant where I found them first, and they’re now taking tipsy berry orders for Valentine’s Day. If you can’t find them around for sale, you can also make your own. Pipettes are relatively inexpensive (order them on Amazon here) and doing them on your own will allow you to choose you liquor of choice. Pick your lover’s favorite spirit, and keep the spirit of romance alive! Hear me out! Lingerie is an obvious gift idea for Valentine’s Day, but who’s buying it for whom? If the guy buys it for his wife or girl friend, is it something she wants, or just something he hopes she’ll wear for him? It probably works better if lady buys it for the husband or boy friend, though of course she’s really buying it for herself to wear for him so… See what I mean!? It gets complicated. You know what never gets complicated? Onesies! You know what’s always comfortable, never makes you self-conscious about your body, and makes a lot more sense for lounging around the house? Onesies! If you really want to add some chill to your Netflix and Chill this Valentine’s Day, give the gift that’s cute and snuggly (just like your special someone?! ), and enjoy some leisure with your love. With a few days left before the big V-Day, there’s still plenty of time to snag a unique gift to add a little extra something to your festivities. Of course, it bears noting that not everyone is a big gift giver or receiver. If you frequent ink. regularly, you may have learned in the last week or two about your love language and that of your partner. In the event gifts don’t speak to the needs of your relationship, then don’t be afraid to give the most out of the box gift of all…which is to skip the gift all together! Make dinner at home, watch a movie, hold hands, hug, make love (for all the reasons on the notepad! ), ask your partner what could make his/her day better, do the dishes, write a love note, send a surprise text. Above all, remember that Valentine’s Day is for lovers! So love someone else…love yourself…love your pets…love that holiday themed chocolates will be 80% off on Friday,..love that regardless of what happens on Valentine’s Day, by this weekend it will be perfectly acceptable to watch Netflix in your pajamas all day! The world teaches hate on a daily basis. One day a year is set aside for lovers. So love something! It’s good for the soul. I love all of these gift ideas Kate, they seem like things guys would actually want. The Night Sky one especially. Almost all the guys I know are big star fans. Thanks for sharing some out of the box ideas. The night sky one is one of my all time favorites, and it makes great art work in your home!